Practice Theory gained considerable significance in the field of sociology and anthropology during the late 20th century. Although the framework is largely attributed to the French sociologist, Pierre Bourdieu (1930 – 2002), his book, An Outline of the Theory of Practice (1972), relies on a significant amount of social theory set forth by scholars such as Max Weber, Marcel Mauss, Anthony Giddens, and Jean-Francois Lyotard. The theory of practice disassembles the binary understanding of the relationship between structure and agency by parsing out the interaction between fields, habitus (and doxa), and capital. Within practice theory, people, or agents, are socialized within a field, which is a structured social space comprised of a dynamic arrangement of social roles and relationships. The ways that the agent engages in social roles and relationships within the field is influenced by different forms of capital, such as wealth and status. 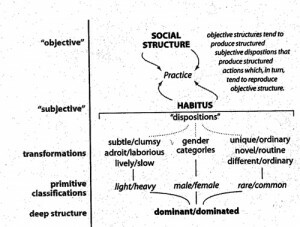 Through constant interaction, the agent eventually becomes habituated to social roles and expectations within the field and they take on a disposition, or ‘ways of acting,’ that is referred to as habitus. The agent’s habitus is informed by their doxa, which is the learned, yet unconscious, beliefs about the social order that is assumed to be ‘common sense’ and taken for granted. For example, socially constructed ideas about gender and race are often taken for granted and accepted as part of a ‘natural order,’ and a person’s doxa regarding gender or race informs their habitus. Without realizing it, people often modify their ‘way of acting’ according to the gender and/or race of the person they encounter. Oftentimes, people are unaware of the changes in their demeanor and behavior, or habitus, because it has become a naturalized part of their interaction. Habitus is like wearing a pair of socks; the sensation is recognizable when the socks are initially placed on the feet, but the sensation eventually fades and the socks are forgotten even though they continue to perform their function for the feet. It is through habitus that structure and agency are turned inside-out. 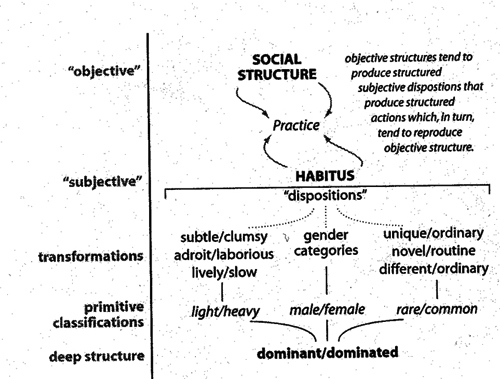 Habitus is internalized structure, and the actions between agents is externalized agency. In lieu of the dichotomized ‘structure’ versus ‘agency’ debate, practice theory presents a more complex model that is based on dialectical interactions between ‘internalizing the external’ and ‘externalizing the internal’. A significant contribution from practice theory within anthropology is the recognition that integral aspects of culture and society are unapparent because actors are unaware of their existence and operation in day to day living. This brings us back to the first module which presented the idea set forth by Mary Douglas, that we cannot truly come to understand ourselves until we try to understand others. It is through the attempt to understand others, that we can become aware of and identify our own doxa which shapes our habitus.